Have you ever heard of a piece of Kabbalistic jewelry called “The Seventy-Two Names Pendant”? 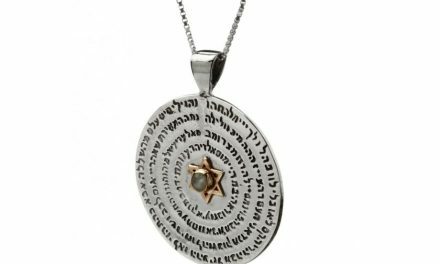 Well, in recent years, this pendant has become very popular, partly due to the fact that large Kabbalah learning centers offer numerous products incorporating the seventy-two names and even teach meditations based on them. I have heard them mentioned more and more in recent years and never took too much notice but then I decided that it would probably be quite interesting to take a look at what this whole “seventy-two names” business is about. What are the Seventy-Two Names? It turns out that the seventy-two letter names are seventy-two names of G-d. I don’t find this surprising as a Jew because it is known in Judaism that there are several different names of G-d, including the four-lettered name that is printed in prayer books today but is pronounced differently to how it is written due to it being forbidden to be pronounced apart from by the High Priest in the Holy Temple on the holiest day of the year, Yom Kippur. Seeing as, as of now, we have no Temple no-one should be uttering this name. Apart from that name there are various different names of G-d in the Bible and Prayerbook and it turns out that according to mystical Jewish teachings (known as Kabbalah) there is a forty-two lettered name, seventy-two three-lettered names (bingo!) and even a 216-letter name of G-d that is created by combining the seventy-two three-letter names. What is the origin of the seventy-two three-lettered names of G-d? Apparently, the seventy-two names of G-d are derived from a passage in the book of Exodus which talks about how when the Israelites left Egypt, were being pursued by the Egyptians and had come to the Red Sea, the angel of G-d and pillar of cloud that usually led the way went behind the camp and came between them and the Egyptians. Somehow the cloud, darkness and night all existed without one coming near the other. Moses stretched out his hand over the sea and G-d made the sea split so that there was dry land for the Israelites to walk upon. The seventy-two names are derived from those verses in the following way-the first name is made up of the first Hebrew letter of verse 19, the first Hebrew letter of verse 20 and the first Hebrew letter of verse 21. The second name is made up of the second letter of each verse and so on. This kind of play with the Bible is actually quite a common phenomenon in Kabbalah seeing as Kabbalists believe that the Torah is multi-layered and has both literal and hidden meanings. How are the seventy-two names used? Well, those versed in Kabbalah apparently know how to meditate on different names when they wish to awaken the power within a certain name. Seeing as there are those that say that Moses split the Red Sea using these seventy-two names it is understandable that the names contain certain powers that allowed him to overcome nature. I am certainly not versed in Kabbalah and do not know how to make use of the seventy-two names but having read up a little more on this subject I do find the concept of the pendant absolutely fascinating and quite awe-inducing. Udi Fili is one of the partners at Canaan-online.com and a hobbyist photographer. Cannan-online features a range of Kabbalah jewelry by Israeli artists and a blog in which Udi likes to write about fashion jewish jewerly.